Move right in to this SkyPoint condo that has beautiful views of the sunset, river & downtown from the 29th floor. Featuring 10′ floor to ceiling windows that are double paned, impact resistant & energy efficient! Recently updated with USB integrated outlets & an ecobee3 smart wi-fi thermostat w/ room sensors & app that allows you to adjust the temperature from your phone. The kitchen boasts granite counters, stainless appliances, 42″ cabinets & breakfast bar. The kitchen overlooks the spacious living room with room for a dining room table & desk. The bedroom has new carpet, gorgeous views & the closet has adjustable built-in shelving. The bath has a shower w/ garden tub, large vanity & laundry closet with a washer/dryer. There is a hall closet in the foyer for additional storage & an assigned parking space in the secure garage. 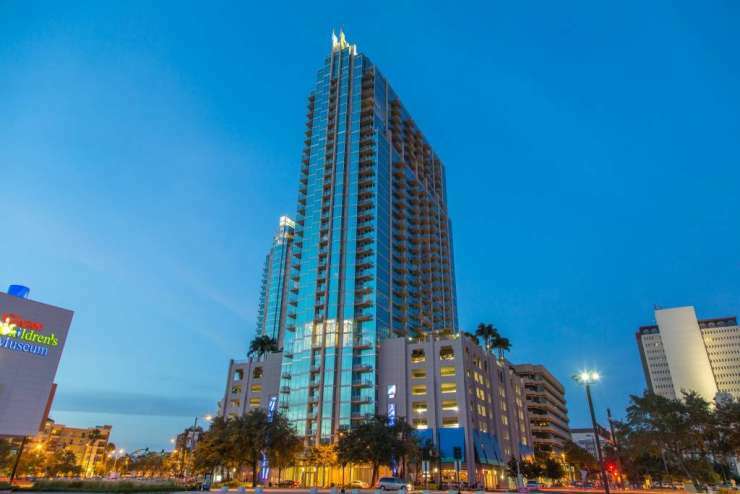 This luxury high-rise is located in the heart of Downtown Tampa. Enjoy the convenience of having a 24/7 concierge service, valet dry cleaning, restaurants on the 1st floor, top of the line fitness center w/ cardio room & separate weight room, clubroom w/ wireless internet, theater room, billiard table & full kitchen for entertaining. Relax on the garden terrace or by the pool & spa w/ brick pavers, wet bar & gas grills! HOA fees include high speed internet, water, sewer, trash & more. SkyPoint is very pet friendly & 2 Dog Parks are located nearby. Convenient to restaurants, museums, Curtis Hixon Park, Performing Arts Center, Tampa Theater, Amalie Arena, TGH, UT, Riverwalk & more!